Mark Gonsenhauser's Rug & Carpet Superstore, Virginia Beach Oriental Rug, Area Rugs and Rug Cleaning expert. | Norfolk Oriental rugs, Suffolk clean rugs, rug cleaning care in Chesapeake. | Best selection of rugs, carpets and custom flooring. I got your rug! Home · Blog · Email Signup · Hours & Directions Take A Virtual Tour of Our Showroom! 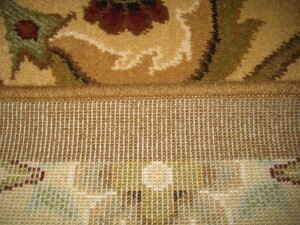 To an untrained eye it is difficult to tell the difference between hand made, hand knotted, and machine made rugs. This guide will help you understand the differences and give you the advantage of making an informed buying decision when shopping for rugs. Hand knotted rugs are made on a specially designed loom and are knotted by hand. The making of hand knotted rugs is a very ancient art that deserves a lot of admiration! 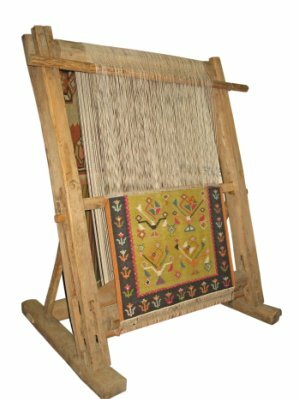 The size of the loom depends on the size of the rug and the weaving is done from the bottom to the top. The rug weaver inserts the “knots” into the foundation of the rug and they are tied by hand, this makes up the “pile” of the rug. This is a very tedious and time consuming operation. The length of time to produce a hand knotted rug depends on the size and intricacy of the pattern. It is not unheard of for a super fine quality 12’ x 15’ rug to take over a year to produce! Hopefully you can appreciate why the cost of these rugs is much greater. Hand knotted rugs can be made of wool, cotton, silk, jute and other natural materials. Silk is sometimes used in wool rugs for the outlines or highlights of the pattern to enhance the design. 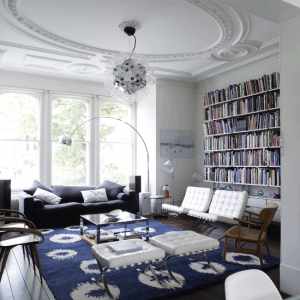 Hand knotted and hand woven rugs can last many generations if they are of good quality and properly maintained. 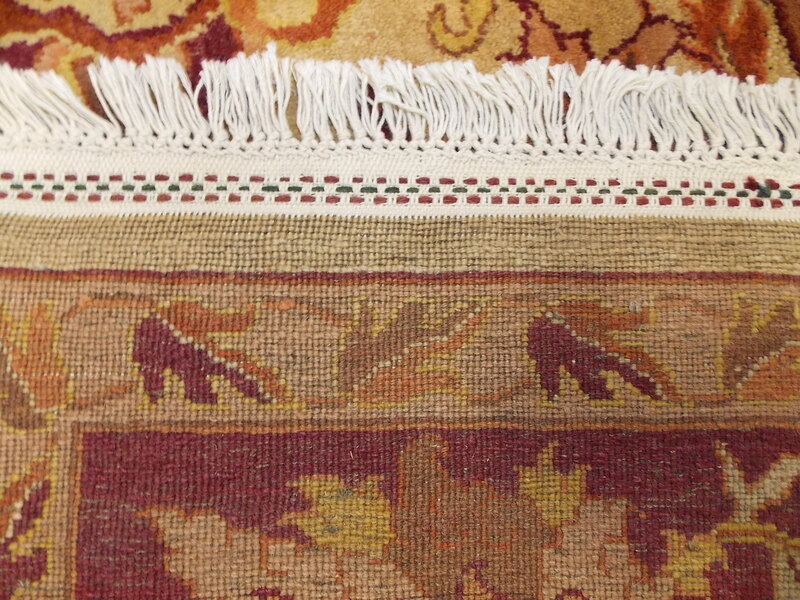 Also called Oriental rugs, hand knotted and hand woven rugs are often collectibles. 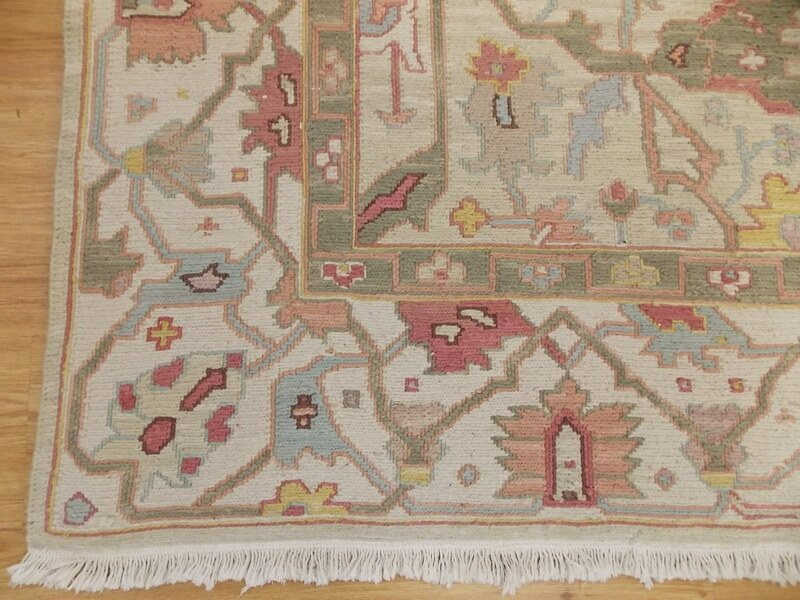 The quality of these rugs depends on numerous factors, such as the knot count, dyes used and quality of the yarns. Hand knotted rugs are typically more costly, but the life span of these rugs is greater and therefore usually a better value for your money. Machine made rugs are made by large machines called power looms. A power loom is electrically automated and controlled by computers. Machine made rugs can be made quickly and are manufactured with materials including wool and synthetic fibers such as polypropylene, nylon, polyester, acrylic and art silk. Machine made rugs can offer a lower price alternative to hand knotted rugs. Machine made rugs usually have a life span of about 20 years or less, depending on the quality and fiber used. 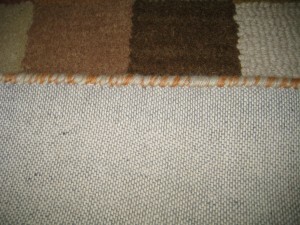 For example a high quality machine made wool rug can last for decades if it is well maintained. Machine made rugs are generally not of any value to a collector. Although there are certain brands, such as Karastan rugs, that have a very loyal following. Karastan brand is made in the US, they have been making rugs for decades, and their rugs are of superior design and quality. Hand tufted rugs are another type of rug that is considered hand made or hand-crafted. 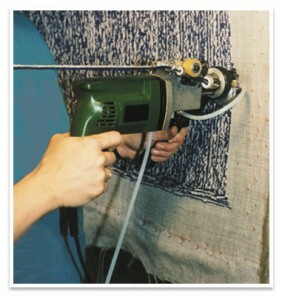 This particular type of rug is made using a modified hand held drill gun that inserts the pile into a cloth foundation which creates a loop pile. If the loop pile is sheared, it then becomes a cut pile. 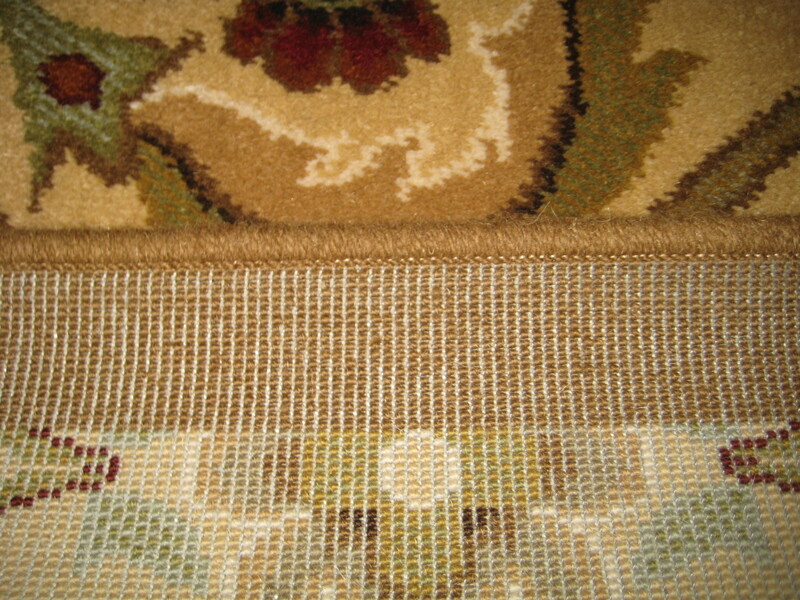 The loop pile rug, if not sheared, is called a “Hand-Hooked” rug. Some designs have both loop and cut pile combined to create a dimensional effect to the pattern. A latex coating is then applied to the back of the rug to hold the “tufts” in place. A canvas type fabric is then applied over the latex coating to finish the back of the rug. These rugs have a hand made look but they cost much less because using the gun speeds up the process dramatically. For example, a good quality 8′ x 10′ hand knotted rug might take anywhere from 7 to 14 months, depending on the quality. While the same size rug made in a hand-tufted method might take one day. Although Hand Tufted rugs can be just as beautiful as hand knotted rugs, they typically are not of value to a rug collector or someone who is looking to buy an Oriental rug as an investment. A latex coating is then applied to the back of the rug to hold the “tufts” in place. A canvas type fabric is then applied over the latex coating to finish the back of the rug. 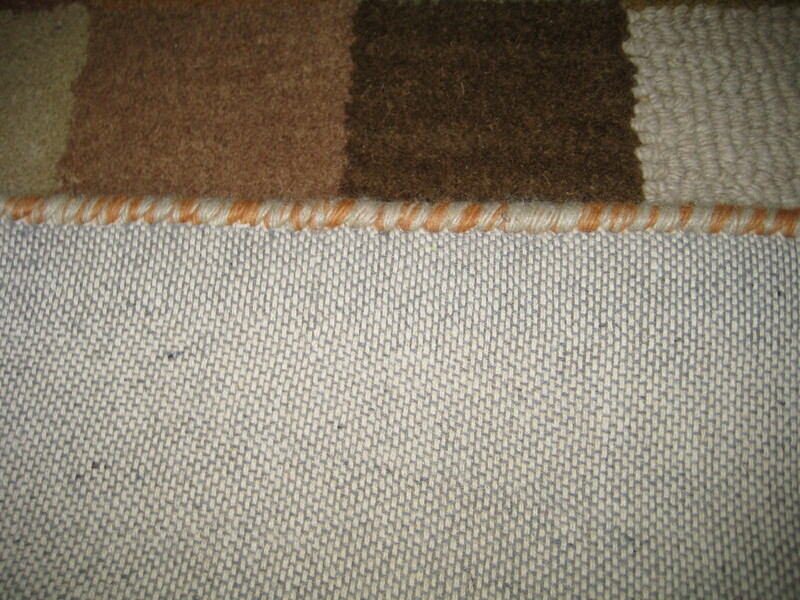 These rugs have a hand made look but they cost much less because using a gun speeds up the process dramatically. For example a good quality 8′ x 10′ hand knotted rug might take about 10 to 14 months, while the same size rug made in a hand-tufted method might take one day. One of the best ways to tell the difference between hand knotted and machine made rugs is to look at the back of the rug. 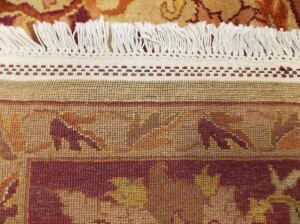 In hand knotted rugs the weaving and the knots will be slightly uneven and not perfectly uniform. On the other hand, a machine made rug will look very uniform and perfectly even. The more detail in the design when looking from the back, the better the quality of the rug. 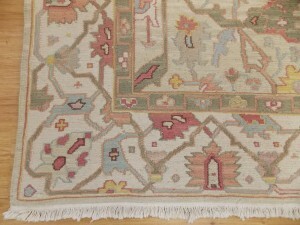 Back of a Hand knotted Rug. NOTE: the fringe is part of the rugs foundation. Back of a Machine Made Rug. NOTE: The fringe is sewn on. 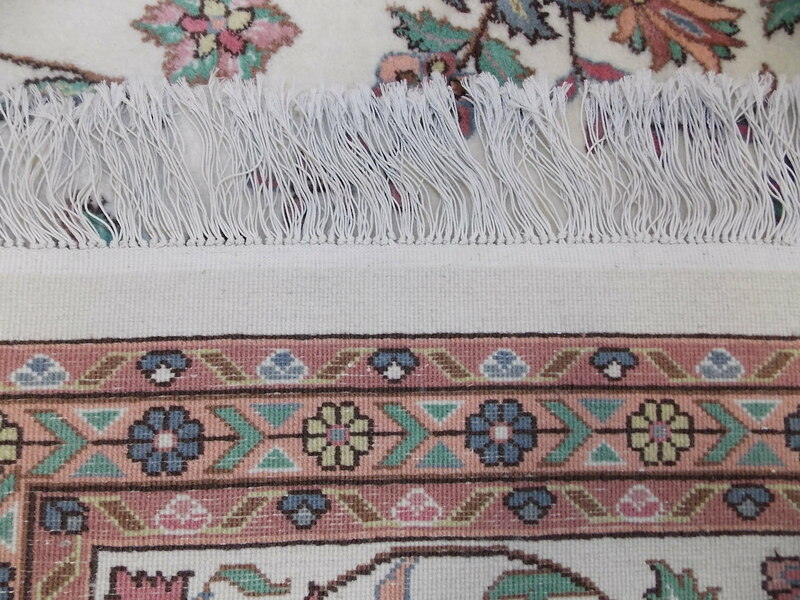 Another way to determine if a rug is hand knotted or machine made is to look at the fringes. 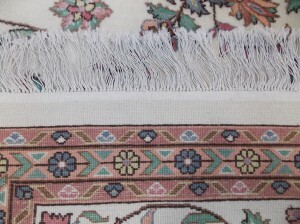 As you can see from the picture above, the fringe of a Machine made rug is sewn on and is attached as a finishing touch. 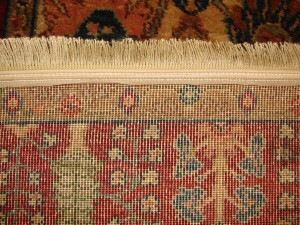 The fringe of a hand knotted rug is an extension of the rug foundation, as in the picture below. 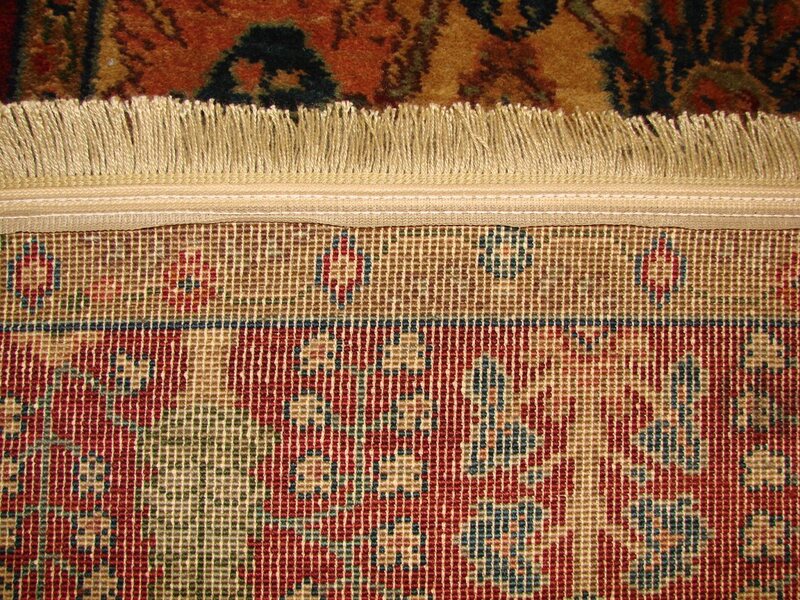 The foundation of a Hand Knotted rug becomes the fringes. We hope this article has been helpful to you! Please feel free to come by our showroom and we will be happy to show you the differences between hand made and machine made rugs in person! Mark Gonsenhauser’s proudly provides the largest inventory of Hand knotted, Hand Tufted/Hand crafted, and Machine Made Rugs in the Hampton Roads area. Our showroom is easily accessible to Virginia Beach, Norfolk, Chesapeake, Portsmouth, Suffolk, Hampton, Newport News and Williamsburg. Click here for map or to contact us. Fill out the form below and we will work to answer you within 24 hours. Or call us at 757.486.6600. The right rug takes your room from dull to dazzling. Does a rug’s knot count really matter? What’s the difference between Mark Gonsenhauser’s rugs and the chain store rugs? Need your rug appraised? We do that!